In aid of the Restaurants du Coeur en Catalogne-Nord. All artistes are participating for free, and all profits go directly to the Restos du coeur des P.O . Les Restos du Coeur Les Restos du Coeur is a French charitable association which provides food packages and free meals to the poor and homeless, organised and served up by 45 000 volunteers around France. There were 417 such volunteers in the PO last year and more are always welcome, particularly if you have a skill such as IT, painting, help with form filling…. that you are able to pass on. The concept was originally launched by popular French comedian Coluche, in August 1985 on a radio programme. It quickly became the ’in’ thing to support and was backed by television and pop stars, artists, sports personalities, media and politicians throughout France. The death in 1986 of this big hearted clown only strengthened the resolve of his many famous friends to continue to support the cause that he had created. 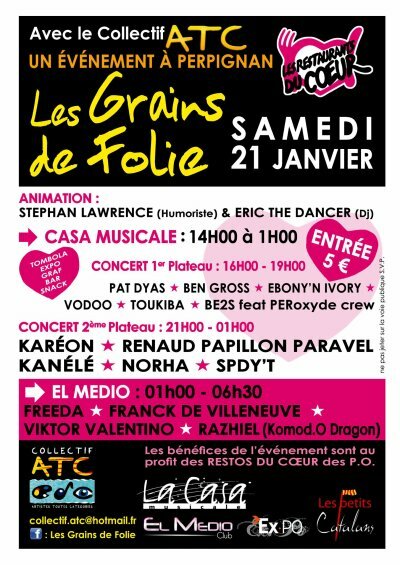 ‘Les Enfoirés’, (a rather rude word if you look it up in the dictionary but I will loosely translate it as the ‘rascals’), some of France’s biggest stars who performed in an annual benefit concert whilst he was alive, continue today to meet up for concerts throughout France, donating proceeds to the Restos du Cœur. By doing so, they prompt the media to explain the goals of the organisation and remind people of where they can donate or volunteer. Today, the organisation has 18 centres in the P-O and is expecting to distribute more than a million meals over the 2009 – 2010 winter period. They also run ‘Les Restos bébés du cœur’ for children, and are always in need of baby products and clothing, high chairs, prams, toys….. As well as donations of food, furniture, cutlery and crockery and of course any financial aid, Les Restos du Coeur badly need vehicles and more space for storage, so if you have a large empty building available, they would love to hear from you!